≤ Mathews Adam Wibert doubled home the winning run in the top of the seventh inning also picked up the victory with six impressive innings as the Mustangs beat Warren G. Harding, 10-0, in Game 1 of a doubleheader. Wibert struck out eight over six innings. In Game 2, Hunter Schoenfeld collected three hits and and drove in two to lead the Mustangs to a 10-9 victory over the Raiders. ≤ Newton Falls’ Nate Humphrey was 2-for-3 and drove in four runs to power the Tigers in a 12-4 All-American Conference Blue Tier victory over Liberty. Julian Cunningham added two hits, including a double, and two RBIs for Falls. ≤ Jackson-Milton’s NIck Rich tossed a two-hit shutout ald also had two hits in the Blue Jays’ 10-0 win over Sebring in five innings. Rich struck out four and walked one. ≤ Bristol’s Kendyl Switzer swatted two home runs and pitched a five-hit shutout to lead the Panthers past Fairview. Switzer finished with six RBIs. Alayna Sines added three hits, including a double, and four RBIs. ≤ Jackson-Milton’s Spencer Christopher struck out 13 and allowed just one hit in Game 2 of a doubleheader sweep by the Blue Jays over Sebring. Jackson-Milton took Game 1, 10-9, and pulled away for an 8-2 win in Game 2. ≤ Cardinal Mooney swept a doubleheader over Berkshire thanks to a pair of strong pitching efforts and plenty of offensive power. In Game 1, Alaina Francis scattered three hits and fanned 11 as the Cardinals won, 6-1. In Game 2, Conchetta Rinaldi crushed two home runs, while Maddie Filisky tossed a five-inning no-hitter as the Cardinals won, 15-0. Rinaldi drove in four. CJ Sapp added three hits — two doubles — and five RBIs. ≤ Bri Callow struck out 16 and gave up just two hits and an intentional walk in pitching McDonald to a 4-2 win over Waterloo in a Mahoning Valley Athletic Conference showdown. The Blue Devils are 6-0 in the league (6-3 overall), while the Vikings are 5-1. Megan Ward hit a home run, a double and a single for the Devils. EAST PALESTINE — McDonald’s boys and girls teams won the Bulldog Invitational. The boys dominated over second-place Springfield, 119 to 56, while the girls were well ahead of second-place Rootstown, 116 to 80. McDonald’s Zach Gray was the boys field MVP by taking second in the shot put and first in the boys discus with a sizable throw of 171 feet, 8 inches. McDonald’s Brody Rupe was the running MVP with first in the 800, 1,600 and part of the winning 4×400 and 4×800 relays. Anna Guerra won the 1,600 and 3,200 to help the McDonald girls, while Blue Devils won the 4×200 and 4×800 relays. McDonald won the 4×800 relay in a time of 10:05.54. Mathews’ Claire Miller took second in the girls discus and shot put to win the girls field MVP. WARRIOR RELAYS: CUYAHOGA FALLS — Howland senior and Arizona State University signee Vinny Mauri won the boys 3,200-meter relay in 9:23.39. His nearest competitor was Solon’s Nathan Close (10:01.30). Howland’s Na’Veyah Parisi led the girls long jump pack with 16-4.75. Lakeview’s Ashley Bowker won the girls 100 hurdles (15.20) and took second in the 300 hurdles (47.03). Lakeview’s Liam Boivin was second in the boys 300 hurdles (41.27). Howland’s Jenna Craigo was third in the girls 800 (2:28.55), while Howland’s William Hines was third in the boys 100 (11.27). Lakeview’s Joe Gomez and Howland’ Michael Schaefer tied for third in the boys pole vault (11-6). GLENOAK EAGLE ELITE: PLAIN TWP. — Boardman’s Raegan Burkey was second in the girls 800 (2:19.82), while Badger’s Miranda Stanhope was third in the girls 3,200 (11:14.55). 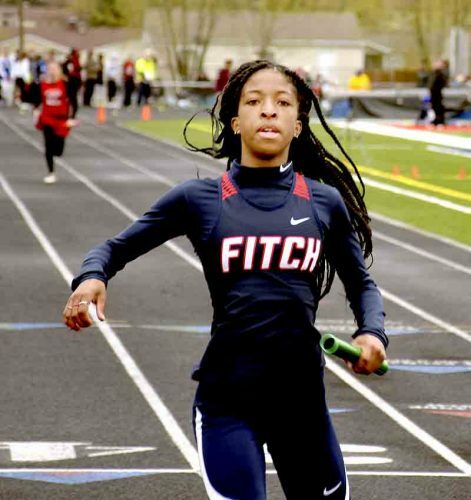 Austintown Fitch’s 4×100 team was second (50.52), while Falcons’ boys 100 runner Isiah Tarver was third (11.23). Fitch’s Deondre McKeever was third in the long jump (20-8.5), while Boardman’s David Merdich was third (51-7.75). Canfield’s Giovanni Copploe edged out Hudson’s Adam Beucler in the boys 3,200 (9:21.54 to 9:22.10) for some of the fastest times in northeast Ohio. Boardman’s Micah Beckwith won the wheelchair events in the 100 (21.95), 400 (1:21.87), 800 (2:49.79) and seated shot put (11-8.25). Beckwith has qualified for state in all events. These athletes are chosen for the state meet based on the best times and throws from around the state. LaBRAE INVITATIONAL: LEAVITTSBURG — Dynesty Ervin and Walt Allie each won the girls and boys 100- and 200-meter dashes. Garfield’s Tyler Klouda won the boys 1,600 and 3,200 to lead the G-Men to a 138-121.5 win over Jefferson. Pymatuning Valley’s Gabe Warsing is the area’s leader in the wheelchair events with 20.82 in the 100, 1:15.76 in the 400 and 18-9 in the seated shot put. Warsing qualifies for state in all of these events.